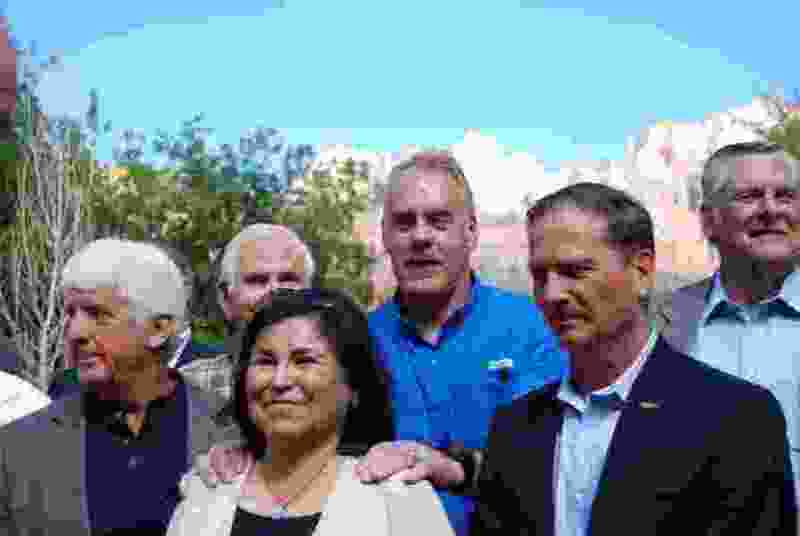 (Brian Maffly | The Salt Lake Tribune) San Juan County Commissioner Rebecca Benally, center, joined Interior Secretary Ryan Zinke, in blue shirt, on a tour of Zion National Park on Sept. 24, 2018. Benally is flanked by Utah Reps. Rob Bishop, left, and Chris Stewart. A Navajo member who lost her re-election bid to the County Commission, Benally strongly opposes the Bears Ears National Monument championed by her tribe's leadership, alleging monuments exclude Native Americans. An FBI investigation into the Oct. 5 shooting by a National Park Service (NPS) ranger remains open and few details are publicly available, but San Juan County Commissioner Rebecca Benally is leveraging the death of Venson Kee Yazzie to advance her case that Bears Ears National Monument is bad for American Indians, even though the 2016 designation came at the request of five tribes with cultural ties to these lands in southeastern Utah. Yazzie, of Chinle, Ariz., was an “innocent” 43-year-old rock art vendor trying to make a living on tribal land when he was gunned down, Benally said at last week’s meeting of the Utah Legislature’s Commission for the Stewardship of Public Lands. “All he wanted to do was sell art at the edge of the canyon so he could provide for his family,” said Benally, a Navajo who will be stepping down as a county commissioner after losing to a pro-monument rival in the Democratic primary. Benally made another explosive, yet unsubstantiated, assertion before lawmakers at the Oct. 18 meeting: Native Americans have not been allowed to hunt deer this season, which opened Saturday and runs through Oct. 28, on lands they have traditionally hunted because of the Bears Ears monument designation. Reached by cellphone Wednesday, she declined to elaborate. Benally leveled these allegations during a legislative discussion of the Interior Department’s draft management plan for the Bear Ears monument, which President Donald Trump drastically reduced to about 200,000 acres last year. While lawmakers accepted her claims, her political foes seized on them as proof she is out of touch with her fellow Navajos. Canyon de Chelly National Monument is on the Arizona side of the Navajo Nation and is managed by the National Park Service and the tribe. By contrast, Bears Ears is administered by the Bureau of Land Management and U.S. Forest Service in coordination with the tribes that proposed the monument. An NPS spokeswoman could not comment on the details of the shooting while it remains under investigation except to say that Yazzie attacked the ranger while armed with a knife on the White House Trail. The officer is on administrative leave pending the FBI review. Benally is the most outspoken and high-profile Navajo critic of Bears Ears. When Utah politicians and Trump administration officials cite anti-monument sentiment among “local” American Indians, they almost always point to Benally while ignoring numerous elected officials in Navajo government who support the monument. She argues environmentalists are “romanticizing” American Indian spirituality to sell a monument designation that she believes won’t protect these lands. The Navajo and four other tribes successfully lobbied the Obama administration to designate Bears Ears under the Antiquities Act. The tribes and several environmental groups are now suing to overturn Trump’s order and restore the monument to its original 1.35 million acre boundaries. Benally’s re-election bid was thwarted this year by Maryboy’s brother Kenneth Maryboy, also a monument supporter and former county commissioner. At last week’s public lands commission meeting, lawmakers also accepted without skepticism Benally’s assertion that the U.S. Forest Service have infringed on American Indians' hunting access, citing concerns raised by a constituent. She insisted the Forest Service “reassigned” Navajo hunters to another area, where there are few signs of deer because of southeast Utah’s severe drought. Mark Maryboy, a rancher who was once named Utah’s hunting educator of the year, said he has heard no such complaints by Navajo hunters. One anti-monument activist, however, believes Benally has a valid point — even if federal land managers have little say over hunting on public lands in and around Bears Ears. Peay’s and other hunting groups have filed papers seeking to intervene in the Bears Ears lawsuit on the side of the Interior Department. The groups argue that monument status infringes on the state’s ability to properly manage wildlife and hunters’ access. Peay’s concerns mirror elected Utah leaders’ assertions that Antiquities Act designations diminish hunting opportunities, but the Bear Ears proclamation signed by Obama explicitly reserves authority over wildlife to the state. At the public lands meeting, Benally incorrectly stated the Forest Service issues hunting permits to American Indians, a task that is actually overseen by the state Division of Wildlife Resources (DWR). The Forest Service has no role in managing hunting, according to a spokeswoman for the Manti-La Sal National Forest, which administers public lands around Bears Ears Buttes. This past summer, DWR sold 250 permits to residents of the Utah portion of the Navajo Nation, according to regional outreach director Morgan Jacobson. These special tags allow holders to hunt anywhere outside limited-entry units in DWR’s entire southeast region, so it is doubtful that Navajo hunters were directed to hunt certain places. Tags awarded to non-American Indian hunters, by contrast, do assign them to specific hunting units. Inside the Bears Ears monument are portions of limited-entry units that are not open to general-season tag holders. But DWR established those units decades before Obama designated the monument.